Peptide therapeutics have been a topic of interest since long back. However, development of peptide therapeutics was put on hold during 1980s, primarily due to the fact that the only mode of delivery of peptide therapeutics was injection. This factor seriously limited the market potential of peptide therapeutics. Development of therapeutic peptides gained a momentum again in 1990s after recombinant proteins were launched in the market. The same drawback of peptides was experienced by proteins, but it increased the pace of research for more convenient delivery forms/technology. This research also benefited peptide delivery and peptides as therapeutics again gained momentum in pharma and biotechnology R&D space. More recent technologies such as controlled-release or nasal/inhaled delivery system for peptides have made these drug forms more palatable to patients. Growing cost of pharmaceutical R&D coupled with decline in number of approved drugs has created an urgent demand for alternative approaches to accelerate R&D activities in last couple of decades. The situation is responsible for revival of interest in peptides as a therapeutic candidates. On a background of patent expiry of blockbuster drugs in last decade and declining clinical success rate, pharmaceutical companies are experiencing a big challenge of shrinking pipeline productivity. To remain profitable in the highly competitive market, pharma companies are identifying opportunities in drug development. Peptides are a unique class of drugs that possess biological and therapeutic properties of small molecules and proteins, yet distinguished from both of them on molecular level. Today peptide therapeutics are thus becoming an important part of pipeline for all big pharmaceutical and biopharmaceutical companies. With increasing demand for peptide therapeutics, production of peptide therapeutics on large scale have become a challenge to the industry. Majority of players operating in peptide therapeutics market have limited production capacity for peptide API, which was creating shortages of peptide therapeutics in the market. This created favorable environment for contract manufacturing organisations (CMOs) and during the period of 1990 to 2010 many CMOs devoted specifically for production of cGMP peptides emerged in the global market. The ability to increase production of peptide therapeutics was first observed by creating synthetic vaccines with the help of synthetic peptides, carbohydrates or antigens. In synthetic peptides, risk of contamination or chemical manipulation of the peptide structure is reduced to create a stable peptide therapeutic. CMOs are thus capitalizing on this increased need for production and pharma and biopharma companies are also looking to outsource their API production operations for peptide therapeutics, in order to reduce the cost of final product. Few such CMOs include Bachem AG, PolyPeptide Laboratories, Corden Pharma etc. among others. Besides large CMOs are also trying for capacity expansion and integrate themselves in the pharma supply chain, which would ultimately benefit the peptide therapeutics market growth. On the other hand, small biotechnology companies are opting to entirely outsource their peptide production as they do not have necessary resources. New and emerging companies are entering the peptide therapeutics market via partnership with biotech companies. After the first chemically synthesised peptide showed commercial success, the number of applications of peptide therapeutics have grown to a large extent. ACTH was the first synthetic peptide launched and this wave spread to include calcitonin, oxytocin, desmopressin etc. There are now over 80 approved peptide therapeutics on the market with a variety of applications, and one drug is approved for more than one therapeutic indications. Cancer or oncology drugs form the largest category in peptide therapeutics market, by value. Some of them are TAP Pharmaceuticals' Lupron, AstraZeneca's Zo-ladex, Sanofi’s Supre-fact etc. Peptide therapeutics for oncology indication are also on top of pipeline of big pharma companies. For instance, Nymox Pharmaceutical Corporation have submitted new drug application for its Fexapotide peptide therapeutic for treatment of prostate cancer. Out of the 43 peptide therapeutic candidates currently being evaluated in clinical trials across the globe, over 30% are being investigated for treatment of cancer. Peptide therapeutics are used for treating prostrate, breast, ovarian and pancreatic cancers. Peptides that are antagonists or agonists of specific receptors in oncology are increasingly being tested at the preclinical stages for their efficacy in cancer treatment. Such oncology studies hint towards the enormous cancer patient pool available globally, which is creating a larger niche for cancer application type in the global peptide therapeutic market. For rapid developments in lifescience and technology to address unmet medical needs, it also requires that regulatory agencies should ensure the safety and efficacy of these products. Since 2011, several new regulatory pathways have emerged that can help boost the approval process for new therapeutics. For instance, in 2012, the Food and Drug Administration Safety and Innovation Act (FDASIA) was signed. FDASIA established a new pathway of breakthrough therapy designation (BTD) which allowed early availability of new drugs that are intended to treat serious conditions and have shown initial clinical evidence of considerable improvement over pre-existing therapies. The BTD program combined with other expedited development and review programs, such as fast track designation, accelerated approval (1992), and priority review designation (1992), promoted innovation through expedited development and review of new drugs. Sceness – a peptide therapeutic being developed by Clinuvel Pharma received fast track designation in 2016. Furthermore orphan designation facilitates the development of medicine specifically for rare diseases. Till now 11 peptide therapeutics have received orphan drug designations, 4 of which have been approved for orphan indication. Currently, there are only 19 approved therapeutic peptides with amino acid chain 30 or longer are available in the markets of U.S, Europe and Japan. However, the scenario is expected to change over time. Investors are more interested in long-length peptides due to improving clinical success rates of these peptide therapeutics. Number of new long-length peptide candidates entering clinical trial are also increasing over time. The FMI report on peptide therapeutics provides detailed information about growth parameters of peptide therapeutics market with the help of a detailed assessment of the competitive environment in global market. The market study provides a comprehensive data on each stakeholder in peptide therapeutics market, including Eli Lilly and Company, AstraZeneca plc, Merck & Co., Inc., Ipsen S.A, Novo Nordisk A/S, Teva Pharmaceutical Industries Ltd. etc. and several contract manufacturing organisations such as CordenPharma International GmbH, PolyPeptide Group, Bachem AG etc. The report provides readers with all-encompassing data on each manufacturer’s revenue shares, winning strategies, and latest information on product launches/approvals in peptide therapeutics market. Internal and external capacity expansion is emerging as a prominent trend among key players in the global peptide therapeutics market. Recently in 2017, five new peptide therapeutics received approval from US food and drug administration (FDA) including TYMLOS (Radius Health), TRULANCE (Synergy Pharmaceuticals), Parsabiv (Amgen), OZEMPIC (Novo Nordisk) etc. Peptides therapeutics are unique class of drugs that possess biological and therapeutic properties of small molecules and proteins, yet distinguished from both of them on molecular level. Peptides are signaling agents for many physiological pathways and thus peptides are thought to be ideal therapeutic interventions for several applications as they mimic natural biochemical pathways. The market study on peptide therapeutics market was recently published by FMI, which provides comprehensive information about the most important market dynamics that prove instrumental in the growth of peptide therapeutics market during 2015-2025. Market players can find the most accurate quantitative and qualitative information about growth parameters of peptide therapeutics market in the report, which can help them to develop data-driven business strategies in the coming future. For the better understanding of readers, FMI report provides salient information about peptide therapeutics market in the most comprehensive manner. The global peptide therapeutics market is segmented according to geographical regions, application, route of administration and drug type, to analyze the segment-wise growth of the market. 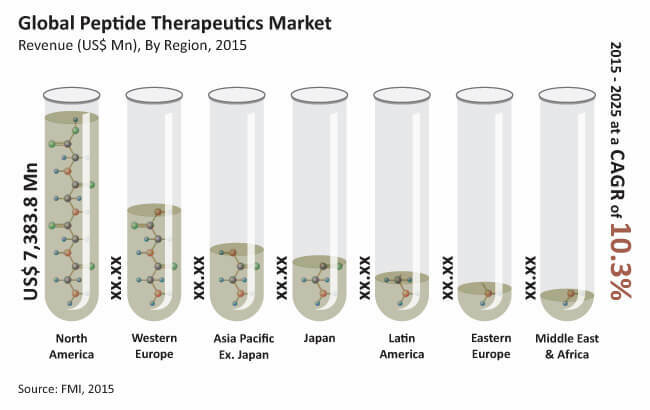 Based on geographical region, the global peptide therapeutics market is segmented into seven regions – North America, Latin America, Western Europe, Eastern Europe, Asia-Pacific Excluding Japan (APEJ), Japan, , and the Middle East & Africa (MEA). Based on application, the global market has been segmented into cancer, cardiovascular diseases, CNS disorders, metabolic disorders, infections, hematological disorders, gastrointestinal disorders, dermatology, respiratory disorders, acromegaly and other applications Furthermore, by route of administration of peptide therapeutics, the global market has been segmented in to parenteral, oral, mucosal and transdermal route of administration. Based on product types, the market is segmented in to branded peptide therapeutic drugs and generic peptide therapeutic drugs. Which application of peptide therapeutics is the most lucrative for investment? How the global peptide therapeutics market has evolved over time? What is in the pipeline of key players in the global peptide therapeutics market? What are the key strategies employed by the players in the global market? The process of market research followed at FMI commences with extensive secondary research of peptide therapeutics market. Analysts obtain industry-validated, historic and current data about the demand and sales of all approved peptide therapeutics across the globe. The comprehensive secondary research is then followed by primary research, where detailed information about peptide therapeutics market is obtained, in terms of value (US$ Mn). Based on thorough secondary and primary research of growth parameters of peptide therapeutics market, analysts come up with the most precise forecast on how peptide therapeutics market is expected to grow during the forecast period. A recent market study published by Future Market Insights – “Peptide Therapeutics Market: Global Industry Analysis & Opportunity Assessment, 2015–2025” consists a comprehensive assessment of the most important market dynamics. The report provides analysis of peptide therapeutics for 2014 and forecast of the market over 2015–2025. The report provides emerging trends and opportunities in the global market, which can help market players.to design their manufacturing, product or business strategies and exploit the maximum growth potential in the global peptide therapeutics market. The report provides analysis on market dynamics in the most comprehensive way for better understanding of readers. In the opening section of the global report on peptide therapeutics market executive summary of the report is provided, which includes the global market overview and key findings. The section also includes market value (US$ Mn) estimates for key segments of the global peptide therapeutics market. This section provides detailed taxonomy and definition of each segment of global peptide therapeutics market. The section helps readers to understand scope of the report, inclusion and exclusion criteria for different products & applications within the scope etc. This section also provides the analysis of global peptide therapeutics market based on optimistic, likely and conservative scenario. This section provides readers with information about the most important macroeconomic and microeconomic factors that are instrumental in shaping the peptide therapeutics market. It helps readers to understand the critical market dynamics such as drivers, market restraints, trends, and growth opportunities for market players in peptide therapeutics market. This section provides overview on clinical development pipeline of peptide therapeutics for major companies. The section provides analysis by phase and therapeutic indications. The section also describes important regulatory pathways in three main markets of U.S., Europe and Japan through which peptide therapeutics are approved for commercial applications. Based on applications of peptide therapeutics, this section elaborates market value analysis for individual applications including cancer, cardiovascular diseases, CNS disorders, metabolic disorders, infections, hematological disorders, gastrointestinal disorders, dermatology, respiratory disorders, acromegaly and other applications. The section explains comparative trend analysis and market attractiveness analysis for each application of peptide therapeutics. The section also provides absolute $ opportunity analysis, which helps reader to identify growth potential for every year. This section provides market size analysis of peptide therapeutics available for administration through different routes including parenteral route, oral route, mucosal route and transdermal route Market attractiveness analysis by route of administration is provided to understand effects of approvals for different forms of peptide therapeutics. Drug type analysis provides analysis on usage and prescription pattern of peptide therapeutics for branded vs. generic/biosimilar drugs. Market attractive analysis by drug type is also discussed to fathom relative lucrativeness of different product types of peptide therapeutics. With the geographical perspective, global peptide therapeutics market is analysed on a total of seven regions viz. North America, Latin America, Western Europe, Eastern Europe, Asia Pacific excluding Japan, Japan and the Middle East and Africa (MEA). Historical trends in peptide therapeutics market and their effects on global market performance is discussed in this chapter. Readers can find detailed information about factors such as recent market developments, pricing analysis, and regional trends that are impacting the growth of the North America peptide therapeutics market. This section also includes the growth prospects of peptide therapeutics market in countries such as the U.S., and Canada. The market performance of peptide therapeutics in Latin America is discussed on a country level (Brazil, Mexico & rest of Latin America) in this section. The section also provides insights on regional market trends in Latin America peptide therapeutics market. This section provides country wise analysis of peptide therapeutics market in Western Europe. Countries covered in this section are Germany, Italy, France, U.K, Spain, Nordic countries, BENELUX and rest of Western Europe. Market attractiveness analysis by country is provided to identify potential of growth for key players in the market. The section highlights regional market trends and pricing analysis for peptide therapeutics. This chapter of the report introduces peptide therapeutics market in Russia, Poland and rest of Eastern Europe by providing detailed information about the growth avenues for market players in the region and growth prospects of the market based on its leading segments. China, India, ASEAN, and Australia & New Zealand are the leading countries in the APEJ region that are the prime subject of assessment to obtain growth prospects of the APEJ peptide therapeutics market in this chapter. Readers can find thorough information about the growth parameters of the APEJ peptide therapeutics market during the period 2015–2025. Readers can find important factors that can make a huge impact on the growth of peptide therapeutics market in Japan This chapter provides the overview of pricing, drivers, restraints, and trends in the Japan peptide therapeutics market. This chapter provides information on how peptide therapeutics market will grow in the major countries in MEA region, such as GCC Countries, South Africa, and rest of MEA during the period 2015-2025. This section provides a dashboard review of competition in global peptide therapeutics market. It details the comparative assessment of key products specific to market segments and competitive position of key players in the global market. Readers can find a comprehensive profiles of key players in peptide therapeutics market, including company overview, revenue shares, strategic overview, and recent company developments, SWOT analysis etc. Market players featured in the report include Eli Lilly and Company, AstraZeneca plc, Merck & Co., Inc., Ipsen S.A, Novo Nordisk A/S, Teva Pharmaceutical Industries Ltd. etc. and several contract manufacturing organisations such as CordenPharma International GmbH, PolyPeptide Group, Bachem AG etc. This section includes a list of acronyms and assumptions that provide a base to the information and statistics included in the report. The section also enlists forecast assumptions and forecast factors considered while estimating the market size. This section helps readers to understand the research methodology followed to obtain various conclusions, important qualitative information, and quantitative information about peptide therapeutics market.